It must be hard being a dad, especially when the Internet is releasing stories about other dads building AT-AT beds for their kids around Father’s Day. I mean, how do you compete with that? You know that lucky child is flaunting the fact that he sleeps in an Imperial Walker at school to his friends. And all those friends are telling their dads, and all those dads are hating on the AT-AT builder for being such a good dad. Not that I really expected mine to build me my own Walker, but it was built out of plywood and PVC – two materials that my dad’s a master with. Just sayin’. Happy Father’s Day to all the dads (including my own!) out there! Sorry for not getting a Tuesday JEFbot posted this week! A perfect storm of events (ain’t that always the way?) has thwarted me at every turn from getting a strip done. I’ll refrain from listing them all so I can get today’s strip posted, but, well, can you believe I’m moving again? I’ll blog about it soon. Thanks – as always – for the understanding! You all are the best. I also dream of this bed. I feel it was an oversight that I did not get one. sounds like you need to have a conversation with your own dad this father’s day, Ranmarru! I…I was not a Star Wars fan growing up. But yes, even I’m jealous of this kid’s bed. ha! i’m jealous of this kid even now, JOE! Did you see my comment about seeing THE x-wing in Denver last week? I commented after you’d already responded to all the comments, so you might have missed it. Here is a link to the crappy cell phone pic of me with the x-wing. http://www.flickr.com/photos/25428243@N06/7340037122/in/photostream/ It is the lone full-size x-wing made and used in the hanger scene where Luke is climbing in with R2-D2 who was lowered into the back. The others in the scene were cardboard cutouts to make the hanger look full (I went back and read the sign I had photographed that explained it – they weren’t added digitally or with sandwiched negatives or whatever, they were actual cardboard versions!). The people I was with couldn’t understand why I was so excited. ah, so true, Shanna. even with the Power of Scrawn, an AT-AT my size will need some serious reinforcement. heheh. Shanna, where is that? Is it in Lowry? I’m in Denver, and I didn’t realize that. It is a former air force hanger that is now an air and space museum. I might be able to track down more info if you need it, but that is all that stuck with me. I’m just not an airplane person, so I wasn’t all that jazzed to be there (till I saw the x-wing of course). I think everyone wishes they had a bed this cool growing up. Heck I’d probably sleep in one of those now if the came in my size. Also, the mental image of a Tauntaun sleeping bag comes to mind seeing this comic. I know that feeling man. I know that feeling. Not over the same thing, but still, I understand about being deprived of awesome things. glad (and sad) you can relate, TCG! hope whatever you were deprived of wasn’t too awesome. Growing up where I did, I probably would have NEVER told anyone I had a AT-AT bed if my dad built me one. That was the clearest way to get harassed at school by other kids for being a nerd. And I wasn’t the biggest fan of Star Wars, so I might have asked for a Klingon Bird-of-Prey bed, instead (although I still would have never told anyone). But that dad sounds incredibly fun. I hope I can just as fun as my son grows up. I already painted his bed with his favorite thing – Angry Birds. Within the recent times as video games become more popular, the idea of a “nerd” has actually changed in classing, popularity wise. That story about nerds one day taking over the world is slowly starting earlier then it used to. true dat, Z. the rise of videogames, computers, social media, the internet and technology in general have all made being a nerd pretty cool these days. I would have loved for my bed to have a auto wash function. My dad actually taught me to play DnD playing with my grandparents, neigbour and his son he also taught me how to play chess (never got that good at it) and he got me into warhammer… he was also the first in our street to have a modem… Yeah, in hindsight my dad was and still is a huge geek. if i found out my dad was a closet D&D geek i might pass out from astonishment, Satoshieyes! yep! still alive and kicking, Insectoid! sorry ’bout the unannounced leave of absence. Looking back, I suppose that if I’d been offered a custom bed like that I would have asked for a replica of the “Galileo 7” shuttle from the original Star Trek. I was a major Trekker back then. i never thought about it until you mentioned it, reynard61, but the Galileo 7 shuttle with its boxy shape would make a great bed! Ha. My brother would’ve liked that. He’s more into Star Wars than I am. I’m not saying I don’t like the series, I’m more into Fantasy/Role-Play. BTW, I checked into conventions down here in Fla, and we’ve got several: Tampa Bay Comic Con (www.tampabaycomiccon.com), Miami Comic Con (www.wizardworld.com/home-miami.html), Florida Supercon (www.floridasupercon.com), and MegaCon (www.megaconvention.com). See, I did the work for you! Glad to be of service, Bot-san! Ah HA my second pair! I shall wear them and the first pair….at the same time! I was told doing so walks a very fine line between the light and the dark side. I found if I look in the right place I can choose though. This bed with the imperial pod computer/desk (it’s both) would be the best room ever. “imperial pod computer/desk”!? sounds awesome. i’m gonna have to google that! ha! sorry to have to break it to you like that, Saeed, but if i have to suffer with the history of no AT-AT bed, we ALL have to suffer. Im sorry to say this but Im with Mombot on this. Mashed potatoes are good, so dont forget to bring them. THEN you get to annoy your folks about might have beens and unfulfilled wishes. mashed potatoes with butter and/or gravy are, indeed, good, Maryz – maybe they’ll quell bot’s inner AT-AT anger. If I was to have a bed back then, I think I was into Vikings, so I would have asked for a bed made out of animal furs and viking replica shields. a viking ship with a dragon head mounted on the bow would be a sweet bed, too, Zolen! an AT-AT bed pretty much equals instant child spoilification, Rainey. i mean, how’s that dad ever going to top himself!? it’s just going to be a steady stream of year-after-year disappointments for that kid after this. Moving AGAIN??? Holy gorrram FRAK! Meanwhile, celebrating Father’s day by doing chores, unplugging the bathroom sink (terrifying monster hair clog the size of a gorram rat!!! ), cleaning the patio with my sons, grocery shopping, and cooking supper while my wife is off at a cheesemaking workshop with her BFF… If I’m bored, I’ll try installing Mac OS Lion on the Mac Pro…. yup! moving again. was moving boxes and furniture almost all weekend, Samuraiartguy, and still have a long way to go… BUH. I haven’t seen a new update in a while. Did I miss something? yep, i’m back, ShadowShuffler! no, you didn’t miss anything – i was just busy getting my apartment ready to be moved and the JEFbot book ready for print so missed an update. hoping the steady apartment move over the next week or two doesn’t interrupt JEFbot updates any further! Wow, that’s one lucky kid I guess. I remember when I was little all it took to make me happy was something related to Thomas the Tank Engine. Anything related to trains still works for me actually. 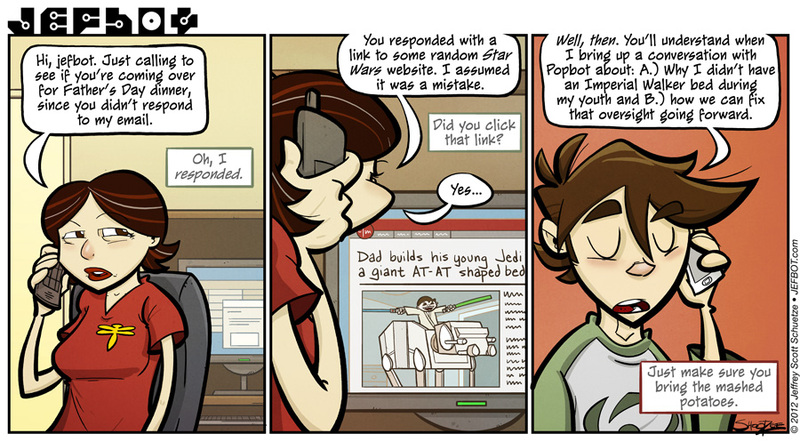 I hope Popbot had a good fathers day. This site seems bent on making me an anonymous person. I have a name! I have a face! I have an identity! I am not anonymous! i was never into trains but pretty much anything related to dinosaurs made me a happy kid back in the day, GB! Dinos right!? When I was a kid my plan was to totally be an archeologist. I loved Dinos, stegosaurus was always a favorite of mine, followed closely by triceratops. What about you bot? i loooved brontosaurus (now apatosaurus) and for some reason protoceratops back then, Ranmarru. stegosaurus was also one of my faves, and of course: t-rex. but, yeah, brontosaurus was my #1. They were cooler for me after jurassic park, but I did love my a bronto. Think many of my decisions on what dinos to love were originally based on land before time. I mean, spike, come on. i miss ducky too. Dogs, cats, hamsters, fish, parrots – who do you prefer? Or dialect mayhap what that bottomless animals – snakes, crocodiles, lizards, monkeys? I’m sure this can be remedied. I’ll consult with Popbot about building you your Christmas present.